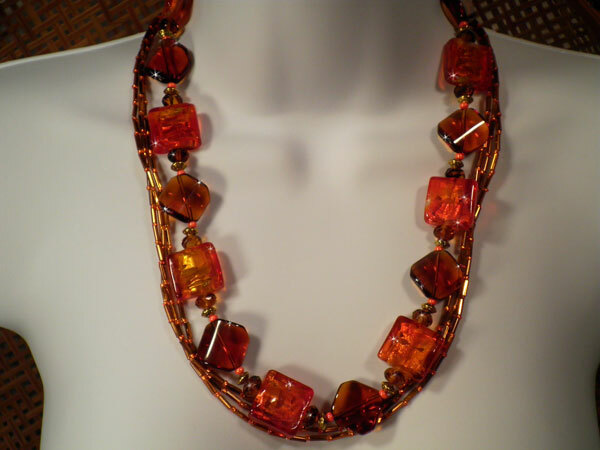 Beautiful warm colors of autumn are in this heavy duty 21" necklace. Heavy glass orange squares and twisted brown glass pieces alternate with gold findings, orange seeds and fully-faceted brown glass discs. That would have made this piece substantial enough, but I've added 3 strands of brown bugle beads that alternate with orange seed beads. It can be worn as shown or twisted a bit so that the bugle beads flow in and out of the larger beads. The colors are gorgeous!